The first time I visited Florence I was in secondary school, which implies the inglorious age range of 11-13. All I can remember is the trip by train, mainly because I have pictures of my history professor sleeping with her check glued to the window. Since I was busy flirting with my young and inexpert classmates, I don’t remember much more of that school trip, with the exception of the nights spent in the boy’s rooms (unsuccessfully). The pictures disappeared, thrown in some trash bin somewhere at home. The classmates disappeared, lost in the passing of the years. My crush on the tall boy is still there-very childish-. My second time in the major city of Tuscany was in 2011, when I had to do the TOEFL exam in the perspective of years of studying abroad. Florence wasn’t the closest place where I could take the exam, but it was the most attractive. I spent four hours on the last floor of an historic building in Piazza della Repubblica in front of a computer, and then I spent five days exploring the city and its surrounding area. Two years ago I fell in love with Florence and I decided I was going to attend college outside of Italy. Independently from the length of your stay, there are two hostels that I highly recommend you: Plus Florence (Website Link) and Hostel 7 Santi (Website Link). Once you unpack your luggage and you refresh your face, put on a comfortable pair of shoes and forget about taxis and heels. The best way of knowing Florence is on foot and with your eyes up, because the surprises are there. 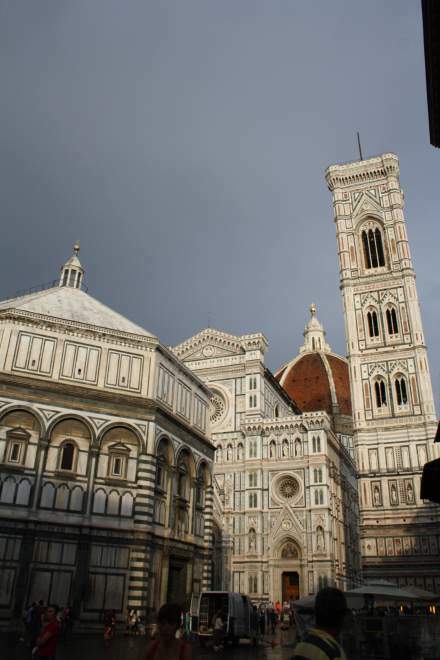 The first note of my serenade is the Duomo: ready to hear it? The Duomo and its Campanile by the artist Giotto punch your pupils. Colors, statues, decorations, and shapes are a choir of harmony, incredible for their balance. No element is either out of tune or pretentious because perfection doesn’t need the excess. In Italy, the Dome represents the city; it is the symbol of the community. In this case, the basilica tells foreigners a story of love and hard-work, while it reminds to Italians a past of glory and beauty. The visit to the inside of the masterpiece of Filippo Brunelleschi requires patience and time as well as an early wake up. In fact, the line of tourists is huge, almost touching the limits of ridiculousness. If the line discourages you, take a sit on a bench of the square and enjoy the façade of the Duomo and its pores breathing art and history. Since sometimes there is also a line for the benches, you might want to move to Piazza della Signoria, where stone steps wait for your tired but.